Posted by admin in Ecuador, Saturday volcano art. The Tigua people of Ecuador live in a rural area south-west of the capital, Quito, high in the valleys of the Andes. 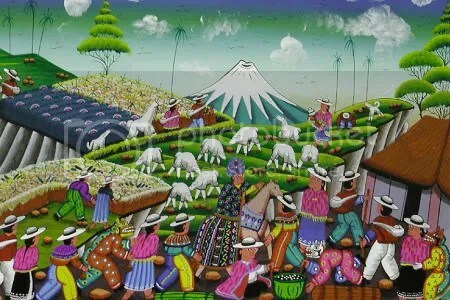 Their colourful and distinctive paintings depict scenes of communal life: festivals, markets, farming, daily activities. The volcano Cotopaxi presides over many of these pictures, symbolizing the spirit of the Ecuadorian landscape. These paintings occupy that shifting and ambigous territory of cultural production in which indigenous artistic creativity depends for its sustenance upon tourist patronage, but they do represent a genuine pictorial tradition, not merely a commodified fabrication. Every part of the picture is filled with colour and life, and naive-seeming but complex tricks of perspective and distortion are used to draw the viewer into the landscape and bring order to the tumult of incident depicted. Tigua art conveys joy, lushness and life: it brims with vibrancy and colour, and conveys the spirit of the volcanic landscapes of the high Andes, and of those who live among them, beautifully. 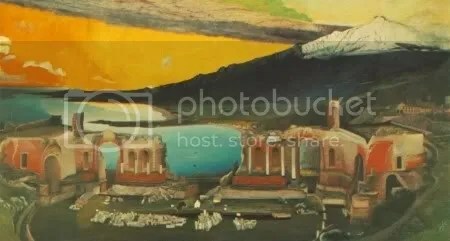 The view of Mount Etna from the Greek Theatre at Taormina is one which has featured in Saturday Volcano Art before: back in March I wrote about ‘Mount Etna from Taormina, Sicily’, painted by the American artist Thomas Cole in 1843. 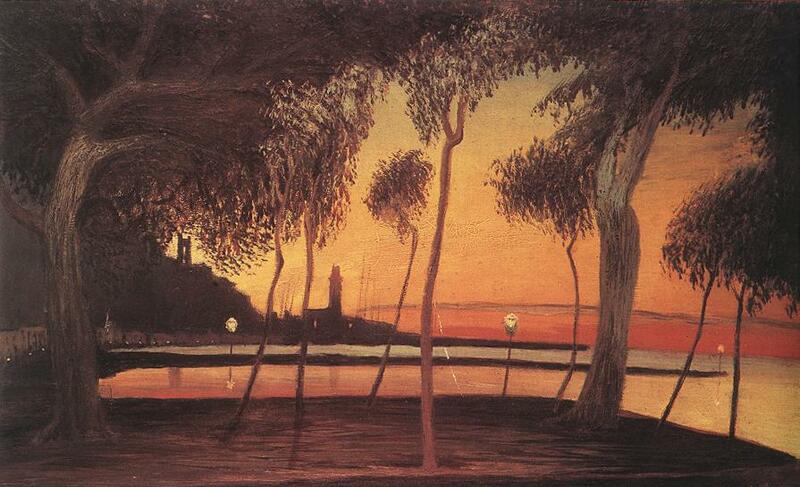 The painting above was completed some sixty years later by a very different artist, and conveys a very different mood. ‘Ruins of the Greek Theatre at Taormina’ was painted by the Hungarian artist Tivadar Kosztka Csontváry (1853-1919). Csontváry was a painter of visionary, mystical temperament who claimed that his vocation as an artist was revealed to him by God. Before this he had worked as a pharmacist. The revelation of his artistic destiny came to him in 1880; he spent the next fourteen years preparing himself by travelling, visiting artists and galleries, and earning enough money to pay for formal training in painting, which he began in 1894. 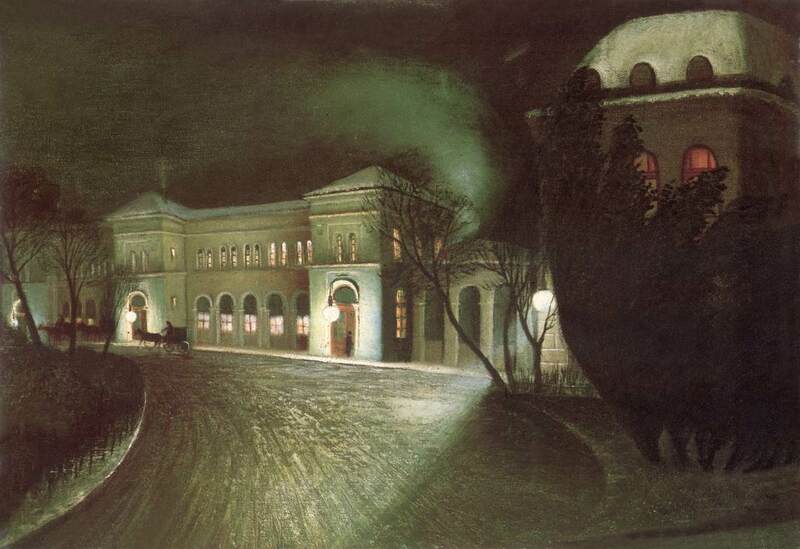 He studied with artists in Germany and in Paris, and began producing his own paintings from 1895. Csontváry painted intensely visionary religious scenes, mystically-charged landscapes both urban and rural, and some remarkable pictures based on his Italian travels, including views of Pompeii and the Bay of Naples. ‘Ruins of the Greek Theatre at Taormina’, which he painted in 1904-5, combines themes that recur repeatedly in his work: the way the past haunts the landscapes of the present, the tension between transience and timelessness, the scale and grandeur of nature. 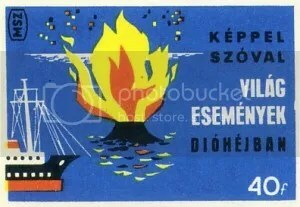 Csontváry’s highly developed theory of colour can be seen in the carefully balanced relationships between blue and yellow in the sea and the lower sky, and the dark reds and greens of the ruins and the landscape. The gradations of colour in the bay beneath the volcano and the bold diagonal of the cloud that reaches out from its slopes give the picture a quality of restlessness, while the snow-capped summit of Etna, white and ethereal, seems to possess an almost spiritual intensity. Yet there is an air of inhuman desolation about Csontváry’s vision that contrasts with Thomas Cole’s lush and harmonious classicism. For Csontváry the volcano is the presiding spirit of a beautiful landscape, but a spirit that remains bleak, remote, and indifferent. 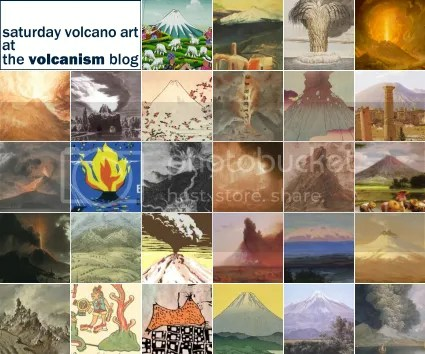 The Volcanism Blog’s ever-popular Saturday Volcano Art feature is taking a break this week: pressure of work is the reason. Back next Saturday. The English painter Joseph Wright of Derby (1734-1797) visited Italy in 1773-5, and was in Naples from early October to early November of 1774. As it happens, this was a quiet interlude in Vesuvius’s eruptive history and Wright did not witness the volcano in eruption, but for an artist drawn to the dramatic interplay of light and darkness, and fascinated by the physical processes that governed the working of the universe, the erupting volcano was an obvious choice of subject, and Wright returned to it more than thirty times in the course of his career. 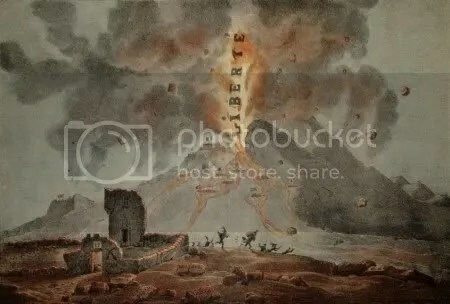 The picture illustrated here, ‘Vesuvius from Portici’, was painted between 1774 and 1776 and is perhaps Wright’s single most dramatic visual homage to the power and majesty of the volcano in eruption. Portici is at the western foot of the volcano on the shore of the Bay of Naples, so we are looking due east towards the summit of Vesuvius, which is about 8 km away. On the left is the remains of Monte Somma; on the right lava flows descend the flanks of the volcano towards the sea, setting vegetation ablaze. Wright’s pictures are commonly organized around a single dramatic source of light, and here the volcano itself blazes like a huge furnace, roaring into the sky amid a swirling mass of cloud that draws the viewer’s eye inexorably towards the focus of the eruption – we seem to be looking down a tunnel of fire and fumes. The little bright flecks visible on the painting are not flaws in the reproduction, but representations of glowing fragments of ash falling to earth. On the left the moon rises, casting a paler glow upon the clouds and reminding us that everything we see in the picture – the volcano with its fires, the fertile landscape, the turbulent sky – is part of the same never-ending natural cycle of destruction and renewal. 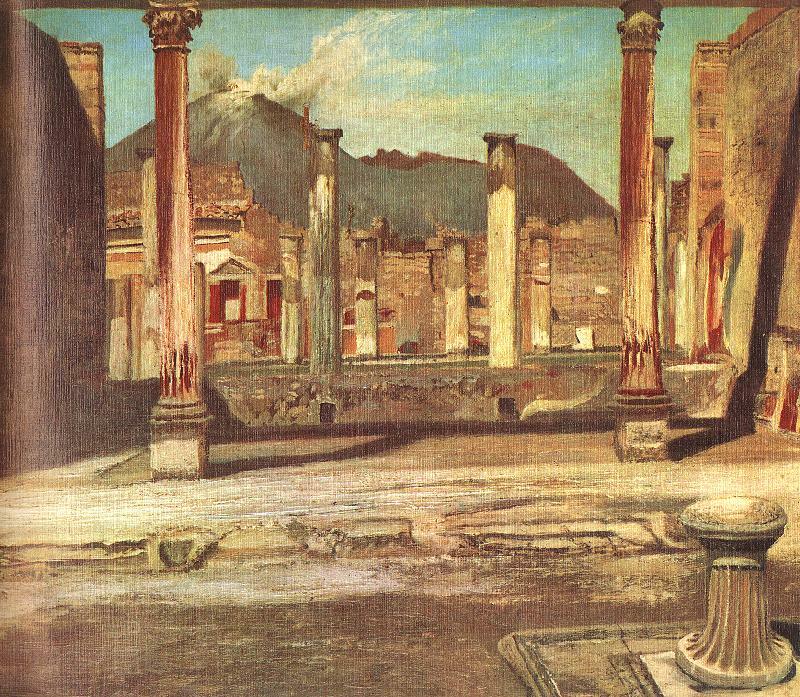 As with paintings of Vesuvius by other artists, Wright has exaggerated the steepness of the volcano’s slopes (compare this modern photograph, taken from the approximate viewpoint of the painting), but in other ways he has been at pains to use a realistic mode of representation, with the landscape of rock formations, foliage, farms and houses modelled in lucid detail. Wright’s work engages in complex ways with scientific enquiry, and here he shows the volcano in the landscape as something awe-inspiring for itself, not as a mystical vision or an expression of divine power: his concern is with nature as something that moves the human spirit, but is also open to human understanding. Joseph Wright of Derby at Revolutionary Players. The English artist J. M. W Turner (1775-1851) exhibited this watercolour of Vesuvius in 1817. It was one of a pair: its companion depicted ‘Vesuvius in Repose’. At the time of painting these pictures Turner, who did not visit Naples until 1819, had not seen Vesuvius for himself and worked from studies made by other artists. 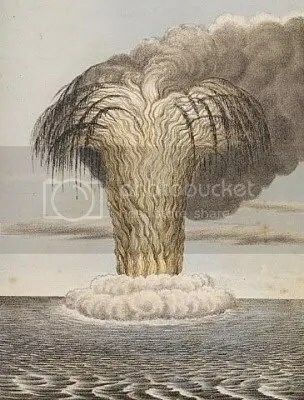 He had already painted a dramatic image of ‘The Eruption of the Souffrier Mountains’ (1815), depicting the major 1812 eruption of Soufrière volcano on St Vincent. 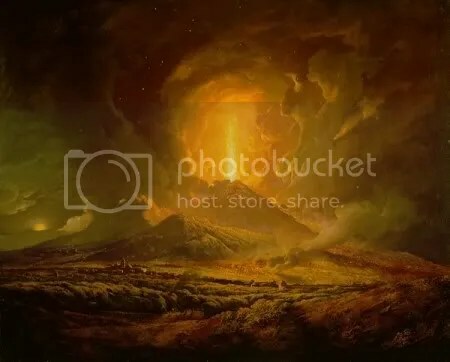 Volcanoes offered the sublime spectacle of a natural phenomenon both beautiful and destructive, and appealed to Turner’s sense of the dynamic cycles of destruction and renewal that governed both natural processes and the workings of human history. The dramatic light effects of this picture vividly evoke the power of the eruption as it roars across the sky and bathes the land and sea in its red glare. The dazzling brightness of the heart of the eruption is created by Turner scraping away layers of paint to the white canvas beneath: the same technique is used to create the jagged lightning that flickers through the eruption cloud. Elsewhere, thickly applied repeated watercolour and gum washes give the picture a depth and intensity of a kind more usually associated with oils. 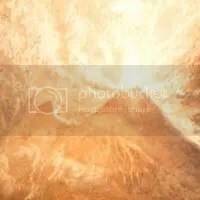 The characteristically Turnerian compositional device of a vortex draws the eye in from the outer edges of the picture to the fiery summit of the volcano, almost swallowed up in swirling contrasts of light and dark. In the foreground, emphasizing the vast scale of the natural forces unleashed by the eruption, the tiny shapes of people can be seen gazing up at the spectacle. 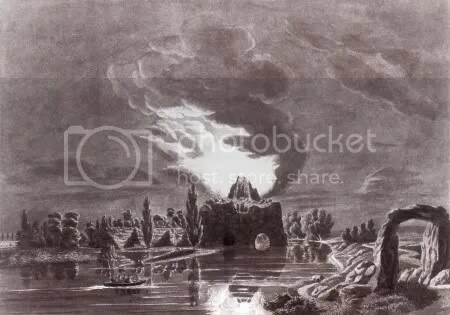 Turner’s expressionistic vision of the volcano can be interestingly compared with the more rationalized classical vision represented by Xavier Della Gatta’s ‘Eruption of Vesuvius’ of 1794. 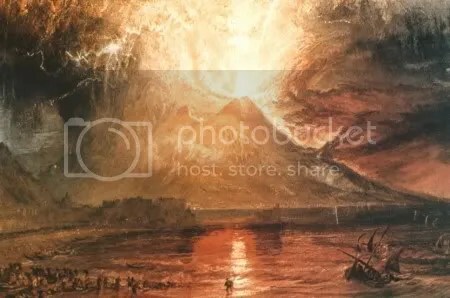 Della Gatta seeks to represent the spectacle of the volcanic eruption, Turner to transcend representation and engage directly with the onlooker’s emotional response. 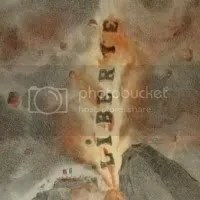 Posted by admin in Saturday volcano art, volcanoes. 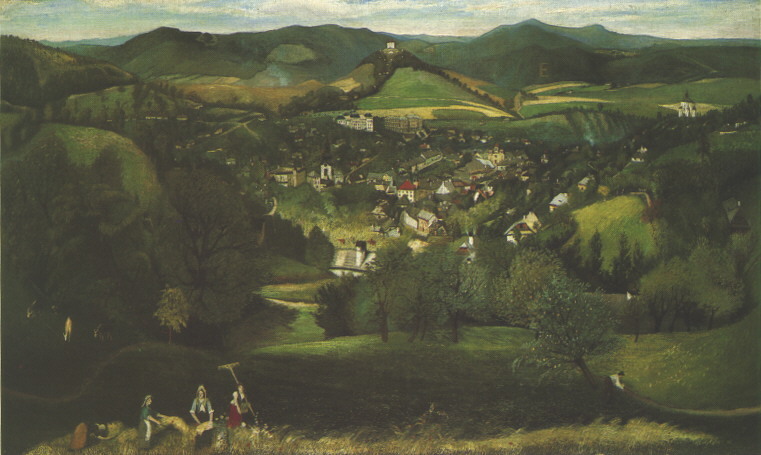 Carl Kuntz, ‘Der Stein zu Wörlitz’ (c.1796). Leopold III Frederick Franz (1740-1817) was the ruler of the small German principality of Anhalt-Dessau in what is now the German Bundesland of Saxony-Anhalt. He was a great admirer of England, making several visits there between 1763 and 1785 and bringing back ‘advanced’ English ideas in economics, agriculture, culture and politics. The ‘natural style’ of gardening fashionable in England at this time inspired the prince to create an English-style landscape garden at his home estate of Wörlitz. For the Prince of Dessau, concerned by the threat posed to his small state by Prussian expansionism, committed to the free thought and liberty of the Enlightenment, and opposed to despotism and tyranny, the English garden was as much a political as an aesthetic statement. The garden realm of Wörlitz was laid out between 1764 and around 1800 in the natural style of planting that characterized the English garden. There is an eclectic range of buildings and other features within the garden: numerous bridges and statues, a house in the Gothick architectural style, a pedimented Temple of Flora, the classical Wörlitz Synagogue – and an artificial volcano. Posted by admin in Fuji, Japan, Saturday volcano art. 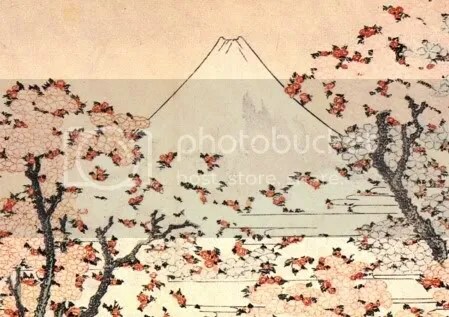 Unfortunately there is no time for a detailed ‘Saturday Volcano Art’ essay this week, so please just enjoy this tranquil image of Mount Fuji by the Japanese artist and printmaker Katsushika Hokusai (1760-1849), ‘Mount Fuji seen through cherry blossom’, from One Hundred Views of Mount Fuji (1834).